The Pacific Regional Society of Soil Science held its annual AGM and workshop on March 29th, 2014. The theme of the workshop was the transfer of knowledge between generations and disciplines. In addition, recent events related to the Agricultural Land Reserve (ALR) were mentioned by many of the speakers. Terry Lewis opened with a dedication to two well-known soil scientists, both of whom recently passed away: Gary Runka and Herb Luttmerding. 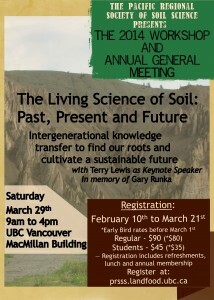 Dr. Lewis gave an outline of soil science’s progression over the past few decades through five non-linear, non-mutually exclusive phases: it began with an initial phase of pioneering work in the field of soil science, followed by a phase focused on surveying all of the soils in British Columbia. Next came a phase that focused on classifying the suitability of land for various agricultural and silvicultural uses, which led to the creation of the land inventories and the Agricultural Land Reserve (ALR). 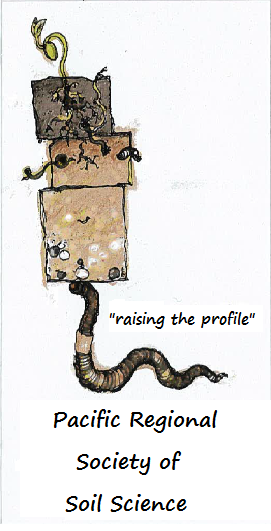 The following phase was centered on science becoming policy and finally came a period of “maturity” in which there was a decrease in the number of government programs and an increase in private consulting, with more users of soil information and an increase in ways to apply soil data. A final stage of uncertainty was added, due to the recent tabling of Bill 24. This stage is characterized by fragmentation and inconsistency in ALR management. 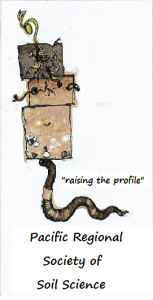 We will likely see a shift towards a more local and therefore disconnected perspective on the management of the ALR rather than a strong and cohesive provincial view. In government, there seems to be a diminution in the role of science in policy making, a common theme in all areas of natural resource management. Dr. Lewis emphasized the importance of having a strong foundation, “know your specialty” as he put it, since this provides the basis for your confidence and helps to create respectful work relationships with others. He pointed out that effective communication skills are essential to convey information to non-soil scientists without the use of jargon. Dr. Lewis also emphasized the value of doing multidisciplinary projects and the satisfaction that they can bring. He expressed concern over who will train the younger generations of soil scientists in field work since it is no longer a role of the government, and concern for the recent lack of cohesion and quality control in our data collection because it occurs at such a fragmented and local level. 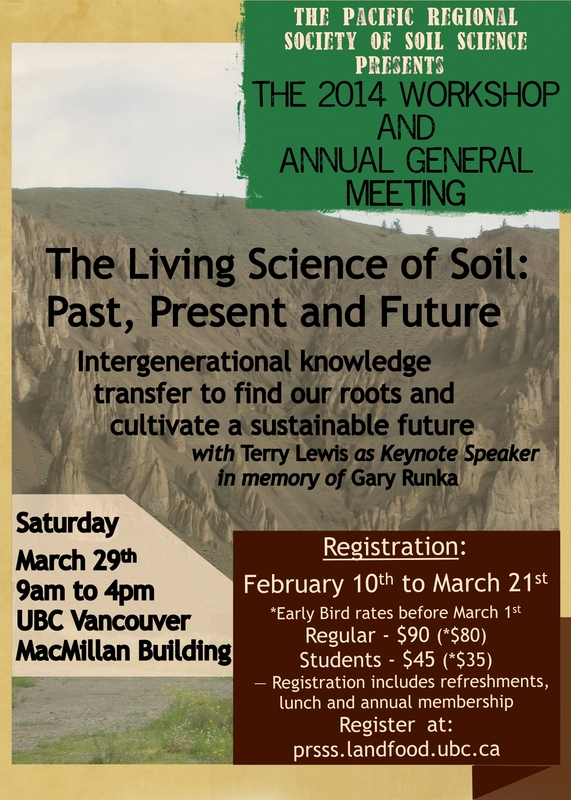 Finally, Dr. Lewis was solicitous about the loss of the collective memory in the field of soil science, but hopes that in this “Digital Age” information will persist and remain accessible to younger generations. David Connell shared his perspective from the field of environmental planning; he described the need to consider soil science within the political landscape. Environmental planning attempts to create a desirable future for communities based on their values and priorities by translating these values into policy decisions about land use and development. Policy regimes are currently characterized by the desire for global competitiveness, grassroots demand for the preservation of farmland, as well as movements towards food sovereignty. Dr. Connell stressed that as a community, we need to decide what we want the role of agriculture and food to be, and what price we are willing to pay to achieve our agriculture and food-related goals. The difficulty with this will be integrating varied public priorities across jurisdictions. Dr. Connell talked about the diversity of crops grown in BC and diversity of the environments used for agriculture in the province. He noted that the ALR only represents 5% of the total land in the province and discussed the implications of having communities beside agricultural land. He also discussed the historic shift in our view of agriculture in B.C. from a social priority to an export commodity. Finally, Dr. Connell discussed considerations involved in any decision to remove land from the ALR and the role of local versus provincial government in making policy decisions regarding agricultural land. He mentioned that while in southern BC, the ALR is most often threatened by urban development, in the north, the threat of resource development is much greater. This may become an issue, especially due to the implementation of a two-tiered ALR system, which takes away the primacy of agriculture in the north and allows more “flexibility” for non-farm activities. Chuck Bulmer spoke about the role of students in digital soil mapping; soil mapping can be seen as the capturing of vast amounts of knowledge into online databases that are accessible to the public. Dr. Bulmer spoke of the importance of creating a digital infrastructure for soils information that can be used and contributed to by all users. This is particularly important now that the government has scaled back its role in soil data compilation and sharing. Information from BC’s soil surveys are already being converted to a GIS format, enabling multiple layers of information about soil, topography, parent material, etc. to be uploaded to a digital map that is easily accessible online. This process needs to be finished and expanded upon for all areas of the province. A potential problem we discussed is quality control; who is accountable for ensuring information uploaded by users is correct? Shannon Berch gave a broad account of 16 different researchers in BC and their current work in the field of soil biology. Their areas of research ranged from associations between plant species and arbuscular mycorrhizal fungi to the effects of environmental change on soil microbial communities. Highlights included hearing about the research of UBC professors Chris Chanway and Sue Grayston, as well as the exciting work Shannon is doing on bringing Mediterranean varieties of truffles to BC. -What experiences had the most influence in shaping your careers? -How could budding soil scientists prepare for the changing needs of society and the environment? Panelists Will Carr, Liz Kenney, Paul Sanborn and Scott Smith described the different paths their careers had taken and offered advice (with the perfect touch of humour) to those entering the field. The importance of conducting field work and taking advantage of unexpected opportunities was echoed by several panelists. In addition, Sanborn emphasized the need for scientists to be vocal and engaged in the political landscape. Will Carr emphasized the importance of learning how to navigate through a field that is fraught with politics and divisiveness. He spoke of a crucial lesson learned from Simon Sinek’s TED talk “Start with Why.” The “why” or the belief behind your work is the most important question to answer; it’s what people will buy into. Other great life lessons recounted by Dr. Carr came from The Four Agreements and The Fifth Agreement by Don Miguel Ruiz, which include the importance of being impeccable with your word (because it is your currency), not to take things personally, don’t make assumptions, always do your best, and be skeptical. Elizabeth Kenney discussed the importance of performing field work in her development as a soil scientist. She feels that key areas of study in the coming years will include responding to climate change, reclamation of disturbed sites, managing nutrient inputs, and the use of technology in the field of soil science. Dr. Kenney emphasized that it will always be important to understand the fundamental processes occurring in the soil and to have the skills to interpret landscapes. Some highlights from Paul Sanborn’s talk were his emphasis on the role of accidents in our formative experiences and the importance of seizing opportunities when they present themselves. He cautioned that in working on large multidisciplinary projects, it is vital to ask lots of questions and be mindful of the difficulties that arise when working on very complicated projects. He discussed the challenge of working in a field where change occurs so slowly is it often hard to see in the human lifespan, but that rehabilitation work can be a pleasant exception. Dr. Sanborn feels that one should make efforts to return to the places where your career has taken you to reflect on your successes and failures. Scott Smith talked about how political forces and situations will have a huge effect in the work that we will be able to carry out. As students today, we need to be prepared for the multidisciplinary nature of projects and we need to have a grasp, even if only tentative, on everything from the molecular scale up to the landscape level. Les Lavkulich closed the conference by stating that soil is a living system, likening it to the human body. In both systems, we can continually add inputs to increase our productivity, but we need to question the cost of these actions. He spoke of the importance of soil for the production of food and forest, cleaning the air and water, as the greatest source of biodiversity, to provide support for buildings and roads, and for spiritual well-being. Dr. Lavkulich explained that humanity is more dependent on photosynthesis than any other process and that soils are thermodynamic systems, meaning that the work that comes out of them is equal to the amount of energy added minus loss to respiration or entropy. We can only increase what we get out of the soil by increasing the energy we put into the soil, which, presently, is dominantly in the form of fossil fuels. We are substituting oil for soil! As humans, we are constantly trying to figure out what factor is limiting our growth and eliminate it. Dr. Lavkulich emphasized the need to understand how our management of the soil has greatly changed the soil we are working with from the original descriptions in the soil surveys. We need to understand the baseline of the soil we are working with and whether our practices are improving or deteriorating soil quality. We need to understand the soil as a dynamic environment. As a whole, the workshop showcased diverse applications of soil science. The speakers were interesting and engaging, and as a younger participant, it was an excellent venue from which to hear the challenges and joys of a career in the field from some of the most experienced soil scientists in BC.